Cheese straws are a very popular appetizer in the South and they are surprisingly easy to make with cheddar cheese and a little cayenne pepper. Every Southern cook has a recipe, and you will find the snack at most parties and festive gatherings. Use sharp cheddar for the best flavor and don't skimp on the cayenne! Put the butter and cheese in the container of a food processor. Add the flour, salt, cayenne, and Worcestershire. Cover and pulse until thoroughly blended. If a food processor is not used, put the flour, salt, and cayenne in a bowl. Add the butter, cheese, and Worcestershire, and using two knives or a pastry blender, blend thoroughly. Wrap in waxed paper or plastic wrap and chill for at least 1 hour. Preheat oven to 300 F. Line a baking sheet with parchment paper or leave it ungreased. Roll small amounts of dough into a long tube about the width of a straw and cut into desired lengths. Alternatively, roll dough out on a floured surface to about 1/8-inch to 1/4-inch thickness, cut into strips, and gently twist. If you roll them into straw shapes, use a flat block or flat wide dish bottom to roll them uniformly. Arrange the strips on the baking sheet. 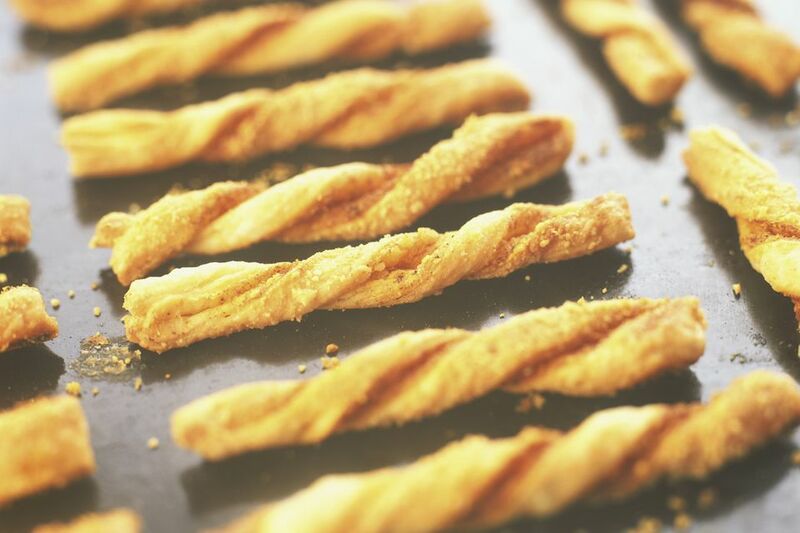 Bake in the preheated oven for 20 to 25 minutes, or until the straws are crisp and lightly browned. Remove and let cool.